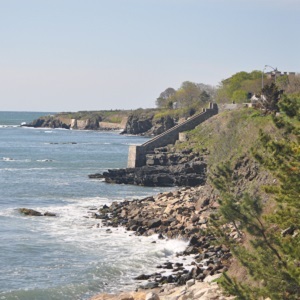 The 3+ mile paved Cliff Walk path offers gorgeous views of the ocean as well as many of the City by the Sea mansions and Salve Regina University. Starting from Memorial Boulevard, it’s just about 0.6 mile to the Forty Steps where you can head down for a front-and-center look at the surf – and maybe even get splashed a bit! You can turn around here, or continue another half mile or so through a stone archway to the intersection with Ruggles Ave. before you turn around and make your way back to Easton’s Beach. Note: the southern section of the Walk (from Ruggles Ave. to Ocean Ave.) includes anunpaved path; it’s rocky and rugged and requires extra attention. Click here to visit the Newport Cliff Walk website. 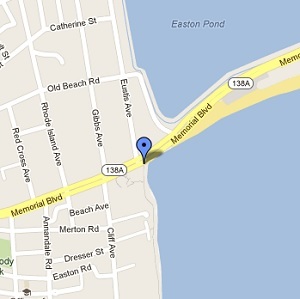 Get directions or follow ours: From the Newport Pell Bridge, take the first exit for Scenic Newport. Turn right onto Route 138A. After about 0.3 mile, turn right onto America’s Cup Ave. Follow for about a 0.8 mile at which point the road will turn into Memorial Blvd. Look for the Cliff Walk sign in the median in about 1 mile. During the off-season, you can park for free just beyond the start of the Cliff Walk at Easton’s (First) Beach. During the summer months there is a fee so you might want to look on Memorial Blvd. or other local streets for parking.